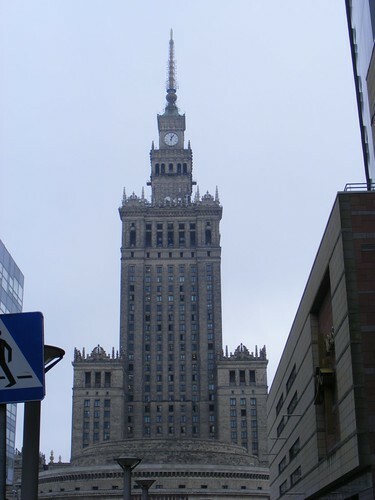 The formidable and controversial Palace of Culture and Science – a gift from Stalin to the people of Warsaw – looms over the city as a reminder of the soviet era. Within the building is a viewing gallery, lots of conference space and the subject of this entry, the Muzeum Techniki. One benefit of the enormous building is that it makes finding Warsaw’s technical museum pretty easy. Stalin’s gift to Warsaw, the Palace of Culture and Science houses the Muzeum Techniki. The museum is spread over three floors and houses historic technology collections including transport, mining, communication, computing and cosmology. There is also a temporary exhibition space where the display regularly changes. 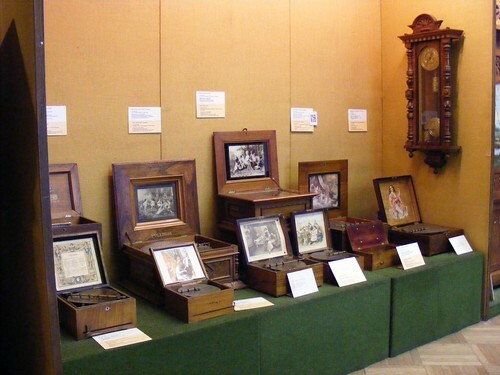 The displays are traditional and do not benefit from modern digital interpretation techniques. Indeed the whole experience is in very stark contrast to Warsaw’s most highly lauded museum, the Chopin Museum, which recently reopened with high levels of digital and interactive display. However, what the Muzeum Techniki lacks in elaborate display techniques it more than makes up for in rich displays of objects. One of the strongest collections on display is of mechanical music technologies, perhaps this is not surprising as many leading manufacturers were based in Central Europe. Music boxes, self playing pianos and other musical treats are on open display for visitors to explore. The mechanical music collection is one of the strengths of the Muzeum Techniki. Other strengths are the computing collection, which includes early Polish computers and Poland’s first differential analyser, as well as some examples of soviet computing. There is also an extensive communications collection that includes Polish manufactured equipment as well as plentiful examples from better known manufacturers, particularly those in neighbouring Germany. One room which is a little less densely populated with objects and housing very few original artefacts is the space gallery. Nicolaus Copernicus is one of Poland’s national heroes, and his cosmological work is presented in juxtaposition with high quality models of technologies from the soviet space programme. Copies of Copernicus’s equipment are displayed alongside some archive material and text panels (in Polish) that describe the cosmological system he proposed. Visitors can round off their exploration of space with a short planetarium show. 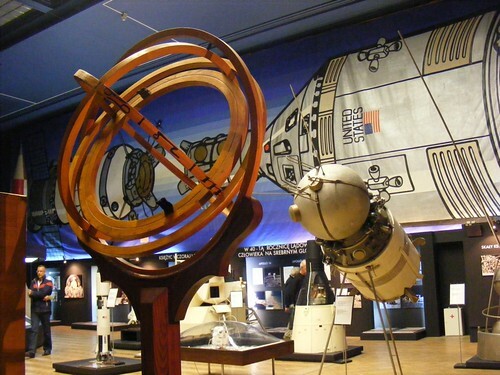 Copies of instruments used by Copernicus sit alongside displays about space exploration. Visitors who don’t speak Polish will find a limited amount of labelling available in English, but interpretation is generally is in short supply even for Polish speakers. For visitors who want more information there are tour guides available for a fee, and it is possible to arrange an English language tour. For those who already have an interest in the history of technology the displays are rich and varied enough to be engaging. However, visitors with little or no background knowledge are likely to struggle to make sense of the enormous numbers of objects they are faced with. Despite that caveat, the Muzeum Techniki is well worth a visit, not least as an insightful contrast to other contemporary museum displays that make extensive use of digital and interactive technologies to interpret the history of science and technology. Marie Skłodowska-Curie Museum – this museum is very light on objects, but rich in images and text about Marie Curie’s life and particularly her early life in Warsaw. The Museum is housed in Curie’s former home in Warsaw’s New Town. 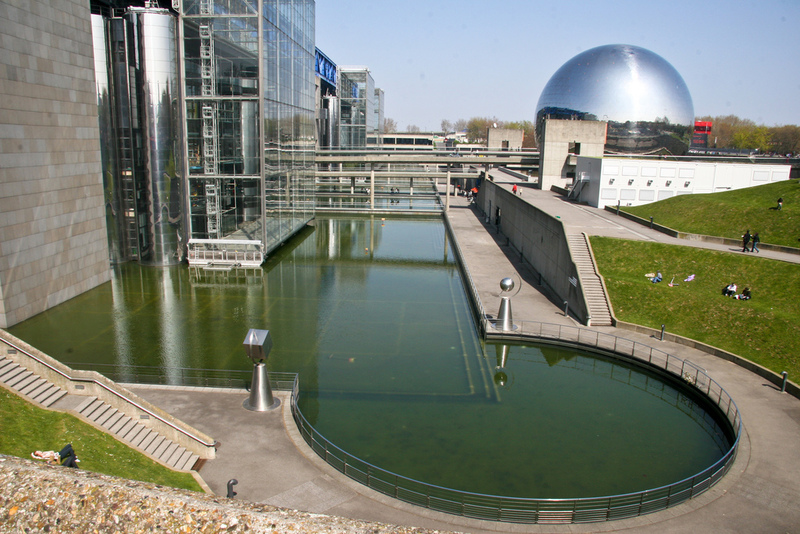 Copernicus Science Centre – the science centre opened in 2010 and amongst other things aims to explain the science behind Copernicus’s work. Copernicus Monument and the Polish Academy of Science – Warsaw’s monument to Copernicus is outside Staszic Palace, home of the Polish Academy of Science. On the ground alongside the monument is a nicely realised diagrammatic representation of Copernicus’s model of the solar system. Formerly known as the Medical History Museum, Medical Museion combines academic research and teaching with public outreach through our exhibitions, collections and social web media interaction. In ancient greek Museion (Μουσειον) is a temple in which the muses who precided over arts and science, inspired perfomers and practioners of music, litterature, philosophy. The name Museion was chosen to illustrate how we are more than just a medical history museum. We are more than a university research department. We are both! The exhibitions are currently available to visitors through guided tours only. Opening hours are Wednesday through Friday and Sunday from 1pm to 5pm. Guided tours start at 1:30, 2:30 and 3:30pm and last for approximately one and a half hour. 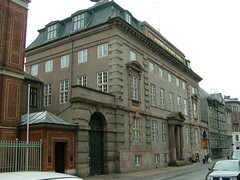 For more details, visit the Medical Museion website. King George V leaving the Science Museum, London, 1928, by Science Museum London. Image licensed under Creative Commons Attribution-NonCommercial-NoDerivs 2.0 license. 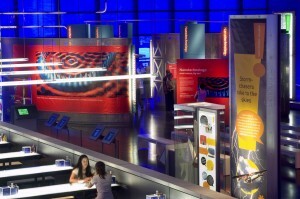 The Science Museum holds the national collections in science, technology, industry and medicine. The huge size and range of the collections is best illustrated by the Museum’s flagship Making the Modern World gallery on the ground floor, where Stephenson’s Rocket locomotive, Crick and Watson’s DNA model and the Apollo 10 command module (on loan from the Smithsonian) are amongst the parade of ‘icons’ in the central aisle. For a more rewarding gallery visit, veer off the beaten track and browse the hundreds of objects in the gallery’s side aisles, which cover historical series and technology in everyday life. Most visitors to the Museum, unsure where to start in such a large building, tend to congregate on the ground floor. It’s easy to spend an entire visit here, taking in the Energy Hall’s steam engines and James Watt’s workshop, and the Exploring Space gallery, featuring Britain’s Black Arrow launcher and a sample of moon rock. But there is much more to be found on the quieter upper floors. Amongst the hundreds of timepieces in Measuring Time (first floor) are fragments of a Byzantine sundial-calendar – the second-oldest surviving gearing known after the Antikythera Mechanism – and the Wells Cathedral Clock, still running after more than 600 years. On the second floor, History of Computing boasts part of Charles Babbage’s brain alongside the Museum’s reconstruction of his Difference Engine No. 2. On the third floor, highlights of the Flight gallery include Amy Johnson’s Jason 1 Gypsy Moth and Alcock and Brown’s Vickers Vimy, while Science in the 18th Century showcases King George III’s magnificent collection of scientific instruments and demonstration apparatus, next door to today’s scientific demonstrations in the ever-popular Launchpad. The fourth and fifth floors are dedicated to the Wellcome Museum of the History of Medicine and contain thousands of objects. (Note: the Wellcome Collection now has its own premises on Euston Road, but the collection remains in the care of the Science Museum by long-standing loan. It is so large and varied that there are more than enough objects to display at both venues). 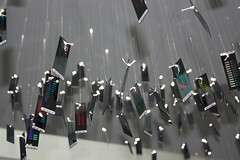 Wellcome Wing, Science Museum, London, 2006, by Science Museum. Image licensed via Creative Commons Attribution-NonCommercial-NoDerivs 2.0 license. 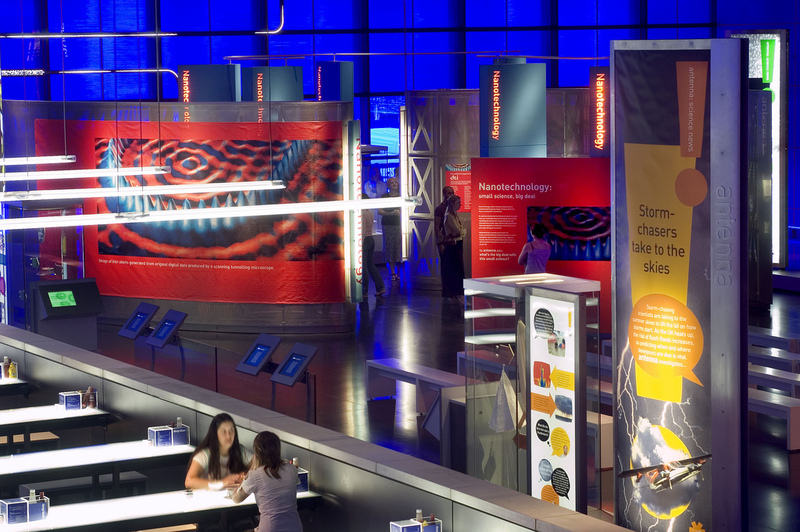 It has often been said that the Science Museum serves a second function, as a museum of museology. Display styles span a range of museological trends, from the 1950s dioramas in the Agriculture gallery (first floor) via the 1980s tableaux of Glimpses of Medical History (fourth floor), to the recently-updated exhibitions on contemporary science in the Wellcome Wing, featuring extensive new media interpretation of genetics, climate change and the latest science news. The Museum is embarking on a new masterplan to redevelop the whole South Kensington site, so catch the older galleries while you still can. While the masterplan is being developed, permanent displays of the physical sciences are rather sparse, with those collections largely moved to storage. They can be viewed by appointment. As with most large national museums, fewer than 10% of the Museum’s collections are on display at any given time, and the reserve collections are displayed in turn via a series of special exhibitions. As of 2012 these include exhibitions on Alan Turing (entrance hall mezzanine), alchemy (second floor), and astronomy (first floor). A series of interventions throughout the Museum re-examines the displays through the lens of climate change, and a regular programme of contemporary art exhibitions and events provide alternative takes on the themes explored by the main collections. Peter J.T. Morris (ed. ), Science for the Nation: Perspectives on the History of the Science Museum, Palgrave Macmillan, 2010. After the last prisoners left Eastern State Penitentiary in 1971, the cats moved in. 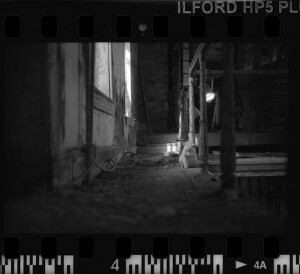 In the early years after its closure the complex was used as storage by the city of Philadelphia, but as the prison walls cracked and crumbled around them, eventually the stray cats became its primary residents. Eastern State Penitentiary. Photo by Sebastian Weigand and licensed under Creative Commons Attribution-ShareAlike 3.0 Unported license. Yet when it opened almost a century and a half earlier in 1829, Eastern State was billed as one of the largest and most expensive buildings of its time. 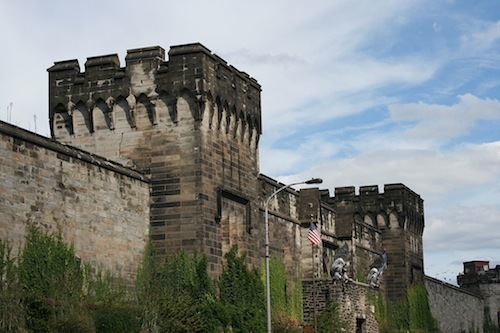 Built at the top of a hill overlooking Philadelphia, the penitentiary was designed to look from the outside like a European castle. The turreted watch towers and arrow slits, however, were just for show — the original towers were never tall enough for a man to stand in, and the arrow slits don’t extend all of the way through the walls. 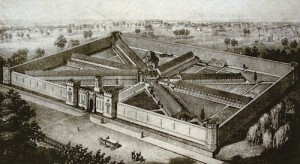 The immediate work of the penitentiary was performed by its more modern technologies. The State Penitentiary for the Eastern District of Pennsylvania, Lithograph by P.S: Duval and Co., 1855. Photo by Mike Graham and licensed under the Creative Commons Attribution 2.0 Generic license. Eastern State was designed by John Haviland (the architect of a number of Pennsylvania civic institutions, asylums, hospitals, and jails) as a radial “hub-and-spoke,” with cell blocks fanning out from a central point. In theory, this design allowed a single person standing at the central point to see any activity occurring on the blocks. Each cell was planned to house only one inmate — this was the basis of the famous “Pennsylvania System” of solitary confinement, designed for Eastern State by prison activists and reformers. These reformers believed that the hours spent alone in their cells would provide inmates with the opportunity for contemplation and penance, and the isolation and surveillance provided by the building’s architecture would structurally enforce this penance. 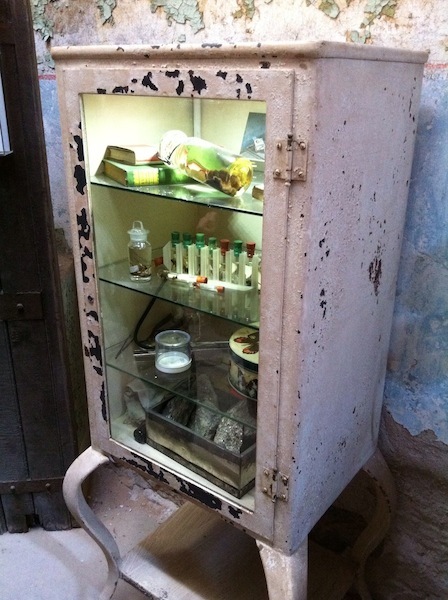 Cells at the penitentiary were themselves technologically advanced for the time; tour guides love telling shocked visitors that penitents had access to a centralized heating system and indoor plumbing before those luxuries were available at the White House. But even these technologies, which today we view merely as modern conveniences, were seen by reformers as part of the technology of control and reform. Having private toilets and sinks in each cell enabled a more total solitary confinement, eliminating reasons for prisoners to leave them. What prison designers didn’t count on, however, was the way that the users of these technologies would alter their meaning — quite quickly, prisoners realized that they could use the pipes in their cells to communicate with each other, tapping out messages that would echo through the walls. By the late twentieth century, Eastern State’s outer walls had become enclosed on all sides by Philadelphia’s expanding population, and many of its internal structures were collapsing. At the time the prison closed, the Pennsylvania System had long been abandoned; in the twentieth century the prison population expanded too rapidly for prisoners to continue occupying solitary cells, and even earlier additional cell blocks were constructed that destroyed the radial surveillance plan. What remained at the end of its life as a prison was a more complicated — and more crowded — complex than originally intended. The building complex remains supremely expressive, focusing attention on its central meanings dramatically, and as inescapably as it once confined its residents…it demonstrates the power of architecture as a socially ordering mechanism as almost no other building can; rarely is the public so aware of the penal policies that have been devised on its behalf…one vividly encounters issues specific to its past: the role of philanthropic action; the sequence of accommodations to other tides in Pennsylvania’s penal history, the evidence of emerging advances in building systems over time…insights into Philadelphia’s urban growth and diversification, into the changing state of medical knowledge, theories of social dysfunction, the treatment of minorities, and ultimately into human nature as exemplified in these populations under control and stress. Cabinet from “Specimens” Exhibition, which highlights and expands upon the amateur entomology collection of an inmate. Photo by Deanna Day. As Herbert Muschamp observed, “prisons make awkward landmarks.” While other historic Philadelphia sites have more obvious narratives that they embody (such as freedom and self-governance at Independence Hall) Eastern State finds itself contending with far more troubling questions about the ways society deals with transgressors, how we engineer technologies to act on our bodies, and how we enable — and resist — certain kinds of expertise and power. Ghost Cat. Photo by Flickr user e_monk and licensed under the Creative Commons Attribution 2.0 Generic license. One of Eastern State’s longest-running installations is a tribute to those emotionally resonant creatures who colonized Eastern State in the absence of other inhabitants. Amid the wild growth that took over the site, a colony of feral cats made Eastern State their home between 1971 and 1991. They were looked after by Philadelphia city caretaker Dan McCloud, who visited and fed the animals three times a week for nearly thirty years. McCloud and his cats were memorialized by Linda Brenner’s “Ghost Cats” exhibition, for which she placed 39 sculptures throughout the cell blocks and grounds. Designed to crumble away over time, as buildings and memories do, the ghost cats were a reminder of the necessity of intervention; neither cat colonies nor castles survive without someone’s choice to maintain or remember them. Brenner described her exhibition as “a testimony to survival.” The last ghost cat faded away in 2011. Julie Courtney and Todd Gilens (ed. ), Prison sentences: the prison as site, the prison as subject, Philadelphia: Moore College of Art and Design, 1995. Charles Dickens, American Notes, New York: The Modern Library, 1996. Marianna Thomas (ed. ), “Eastern State Penitentiary: Historic Structures Report,” Philadelphia: Philadelphia Historical Commission, 2 vol., 1994. City of Science & Industry by Katchooo. Image licensed under Creative Commons Attribution-NoDerivs 2.0 Generic license. This is a monstrous “theme park” extolling science and its applications, which must be seen to be believed. Whether one will be any wiser after a visit will be a matter of experience and temperament. It is likely to be most useful as a supplementary resource for school children taking elementary science courses and guided by their teachers. The glossy high-tech approach may appeal especially at that level. 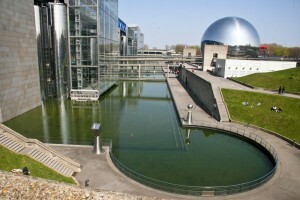 The overall tone is set by what one sees at first entry, the Geode, a giant steel globe with a mirror surface and an auditorium within it, its tiers of 357 seats suspended from a single pillar. Scientific instructional films are shown here around the clock. Beyond the Geode is the Explora, which houses the main exhibits, divided into four sectors: “From the Earth to the Universe,” “The Adventure of Life,” “Matter and the Work of Man,” and “Language and Communication.” Headsets can be rented to pick up running commentaries in four different languages as one wanders about, and there are also informative panels, TV sets with instructional video shows, and interactive gadgetry of all kinds. Some items are very good and quite sophisticated-an excellent hands-on apparatus for proof of Pythagoras’s theorem and a clear demonstration of symmetry axes, for example, in the mathematics section at Level 1 of “Earth to Universe.” Others seem merely tawdry-a winding trail “in the eye of the microscope,” for example, in “Adventure of Life,” or a huge panel map of the earth that lights up to show where polygamy or polyandry is practised. Many of the exhibits are geared to familiar modern technology: rockets, jet planes, a submarine, particle accelerators, ecosystems, and so on. Who invented the steam engine ? It was not James Watt who is widely credited with this, but Thomas Newcomen. The first practical and successful steam engine, installed in over 1400 locations by 1800, was designed by Thomas Newcomen (1664-1729), a Dartmouth ironmonger and blacksmith. After 1775 the Newcomen design was improved by James Watt, but it was Newcomen who deserves the credit for an engine ‘that changed the world’, providing power to pump water from coal mines – and other applications- throughout the world. This led to greatly increased availability of coal, and the wide application of steam engines in factories and elsewhere. Thomas Newcomen has therefore been called a Father of the Industrial Revolution. In 1963 the Newcomen Society of London wanted to create a suitable memorial to commemorate the 300th anniversary of Newcomen’s birth, and were able to acquire an original engine dating from 1725, then sited at the Hawkesbury Junction of the Coventry Canal, and move it to Dartmouth. Study of this engine showed that the wooden beam and cylinder were original, although the valve gear had been replaced and a ‘pickle-pot’ condenser had been added below the main cylinder later in the 18th century. This was to improve efficiency by condensing the steam away from the main cylinder, avoiding a wastage of heat caused by water cooling the main cylinder. This greatly improved the engine’s efficiency. 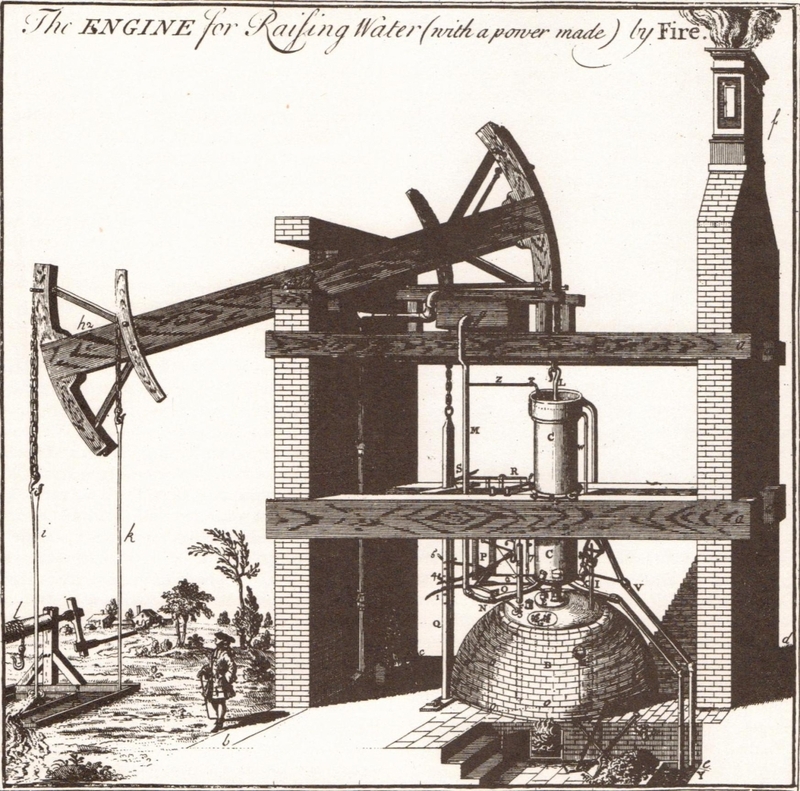 James Watt’s engines were designed with a separate condenser after 1775, for the same reason. 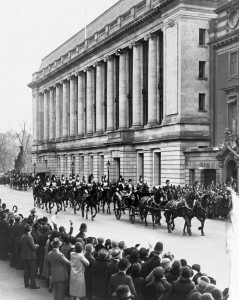 With the agreement of Dartmouth Corporation the Memorial Engine was set up in a building formerly an electricity sub-station in Dartmouth’s Royal Avenue Gardens, and officially opened on 24 June 1964. A hydraulic mechanism has been added to allow the engine to be set in motion without the use of steam. The Memorial Engine is now administered by the Dartmouth Tourist Information Centre, and can be accessed through the TIC office. It is believed to be the only Newcomen Engine that can still be seen in operation, apart from the replica engine at the Black Country Museum, Dudley. 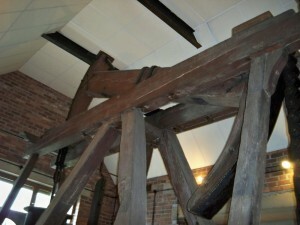 Dartmouth’s Newcomen Memorial Engine, showing the wooden beam with arches. Photo: Eric Preston, July 2011. The first Newcomen engine for which documentary evidence is available was installed in 1712 at the Conygree Coal Works near Dudley Castle in Staffordshire. It made use of atmospheric pressure as well as steam, and was consequently called an ‘atmospheric engine’. Many other similar engines followed, including one installed in 1725 at Griff Colliery near Coventry. It is this engine (according to Dr. Cyril Boucher of the Newcomen Society) that can be seen operating at the Newcomen Engine House in Dartmouth, Devon. These first engines were installed under a patent obtained by another Devon engineer, Thomas Savery, which covered the use of atmospheric pressure and condensed steam to pump water from mines. He called this method “raising water by the impellant force of fire”. However Newcomen’s engines, unlike Savery’s, used a vertical cylinder with a piston, whose movement was transmitted to the mine pump by a large wooden beam. Whereas Savery’s engine had not been successful in practice, Newcomen’s was reliable and soon became widely used, with 125 engines installed worldwide by 1733, and over 1400 by 1800. The ‘atmospheric engine’ works as shown in the Figure above (click for the fullsize version). The open-ended brass cylinder is mounted directly above a boiler. Steam is allowed into the cylinder by opening a valve, and then condensed by a cold water jet fed into the cylinder. 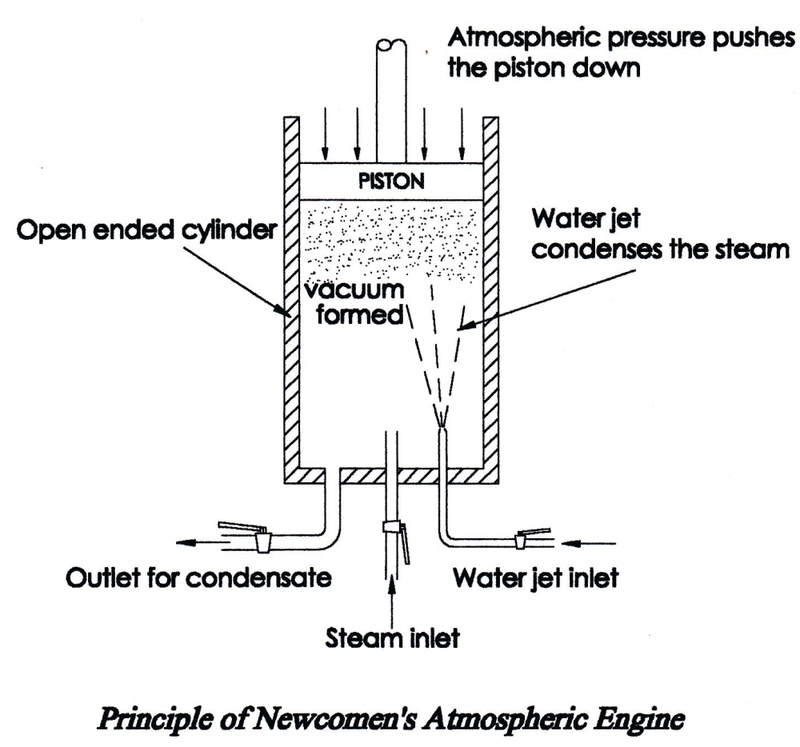 This condenses the steam rapidly, causing the piston to be forced down by the atmospheric pressure above. This movement is transmitted to the mine by a large wooden beam pivoted in the centre and connected to both the piston and the vertical rod operating the mine pump by chains. The weight of the pump rod draws the piston back up the cylinder ready for the next stroke. The valves were operated automatically by levers worked by the movement of a ‘plug rod’ attached to the moving beam. The steam pressure was kept low to avoid leakage. The first engine worked at 12 strokes per minute and had 5.5 horse-power, raising 10 gallons of water from a depth of 150 feet at each stroke. Various minor improvements were made as experience was gained, but this design remained basically unaltered for over 60 years. Mr. Brian Parker of Dartmouth Museum, for the map showing the location of the Dartmouth Memorial Engine. Thomas Newcomen, Engineer 1663/4-1729, by H.W.Dickinson 1929, revised 1989, pub. by The Newcomen Society, Abbot Litho Press Ltd, Newton Abbot. Thomas Newcomen of Dartmouth and the Engine that Changed the World, by E.J.Preston, 2012, pub. by Dartmouth and Kingswear Society and Dartmouth History Research Group (ISBN 1-899011-27-7). 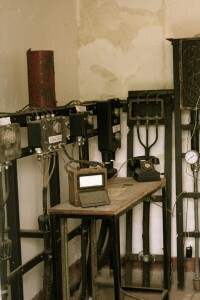 Porthcurno telegraph cable station, April 2011 by jojo 7. Image licensed under Creative Commons Attribution-NonCommercial 2.0 license. Anyone interested in the history of communication is truly spoilt for places to visit in the Cornwall. It’s got sites covering a wide range of technologies from semaphores (Lloyd’s Signal Station) and cable telegraphy (Porthcurno Telegraph Museum) to wireless (the Marconi Centre and Lizard Wireless Station) and satellite communication (Goonhilly). Most are relatively straightforward to access by public transport but do take into account long journey times: buses are not as frequent as you might expect and they often take very circuitous routes! If you have to visit just one place, make it Porthcurno, three miles from Land’s End. It’s the only working submarine cable station in the world and also holds an enormous collection of instruments, artefacts and archival materials relating to the history of submarine cable telegraphy from the 1850s to the present day. Visit the museum and you’ll be able to see electromechanical and electronic apparatus whirring and clicking as smoothly as they did in the 1920s and ‘30s. 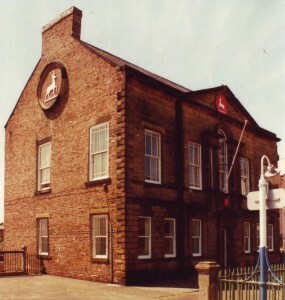 Most are operated and lovingly maintained by former engineers of Cable and Wireless – the firm that for much of the twentieth century used the museum buildings as a cable station and training college. You should also wander round the museum’s ‘Nerve Centre of Empire’ exhibition to explore the lives and places of the men and women who helped keep Britain’s imperial telegraphic system running. 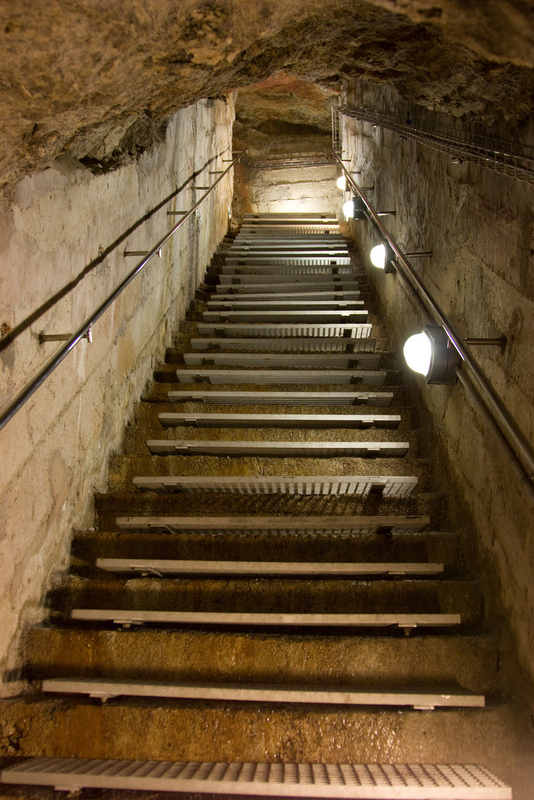 And don’t forget the underground tunnels built in the Second World War to safeguard the crucial British imperial telegraphic network against enemy attack. The museum is open seven days a week, 10am-5pm. For directions and further details see http://www.porthcurno.org.uk/index.php. Porthcurno Telegraph Museum, by Nick Hubbard. Image licensed under Creative Commons Attribution 2.0 license. You can’t understand the development of cable telegraphy in the twentieth century without wireless. Maybe after visiting Porthcurno, take a trip around the coast to the Marconi Centre, on the Lizard. Run by the National Trust and the Poldhu Amateur Radio Club, it’s located on the site where Marconi’s first transatlantic wireless messages were transmitted in December 1901. The museum boasts a splendid collection of early wireless equipment, some excellent audio-visual material, and a hugely knowledgeable staff. Don’t forget to take a look at the nearby remains of the transmitting station and the memorial marking Marconi’s transatlantic achievement. The museum has rather restricted opening hours: during July it’s open on Wednesdays, Thursdays and Sundays 1.30-4.30pm, and Fridays 7-9pm. It’s best to ring 01326-241656 to arrange a visit. For directions and further details see http://marconi-centre-poldhu.org.uk. Not far from the Marconi Centre is another Marconi site owned by the National Trust: the Lizard Wireless Station. This is the original wooden building in which Marconi and his colleagues conducted experiments. The museum displays replicas of the induction coil, spark-gap, Morse key and other equipment used by Marconi, and also houses an amateur radio station. For opening hours ring 01326-561407, and for further details see http://www.lizardwireless.org/. 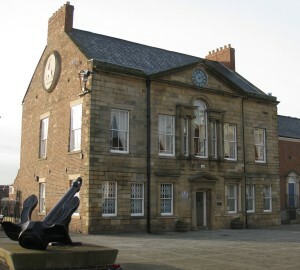 At the bottom of Howard Street, North Shields, sits a building that has changed its purpose and transformed its significance in line with the surrounding area and its inhabitants. 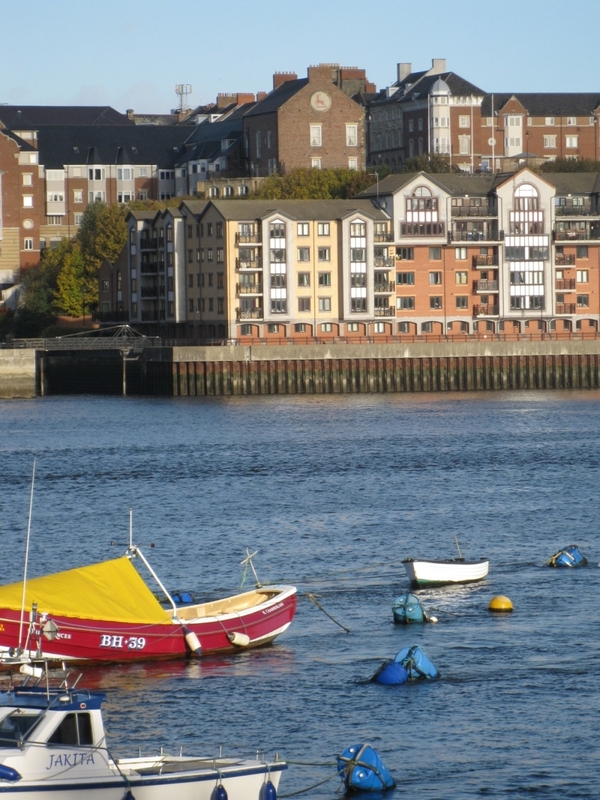 North Shields, a one-time thriving shipping community at the mouth of the River Tyne, now has precious few reminders of its important past as one of Britain’s leading maritime ports, along with the likes of London, Liverpool, Glasgow and Cardiff. 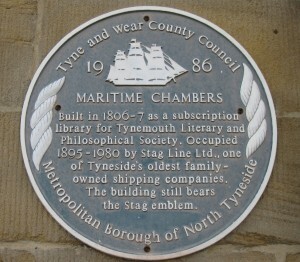 This building, also known as Maritime Chambers, is one of these reminders. 1 Howard Street was first designed in 1806 as the subscription library (the first in the North of England) for the Tynemouth Literary and Philosophical Society. It served in this important capacity until it was bought by local shipowners the Robinson family in 1891, who used it as their company headquarters for ninety years until October 1981. After a brief period as a pub/restaurant (in the basement) the building changed purpose again and is currently being used as a Registrar’s Office, with marriages being conducted in the old shipping directors’ offices. It has been estimated that there were at least 90 Tyneside shipping companies that have ever owned tramp ships. 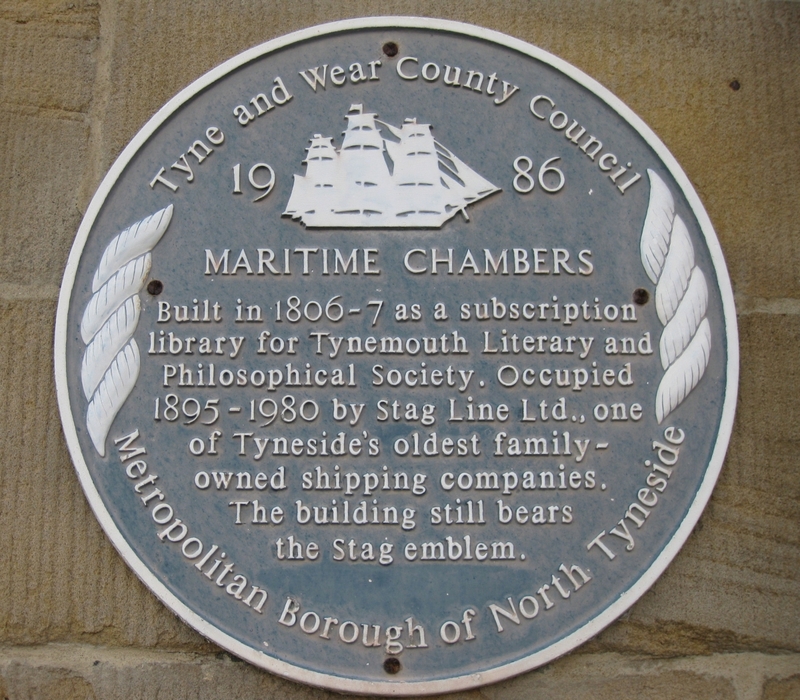 The Robinson family of North Shields owned and ran one such company, helping it to become one of the most respected and locally renowned tramp shipping companies throughout most of the nineteenth and twentieth centuries (a tramp ship is generally defined as a cargo vessel following no set routes, picking up trade when and where it can). The first vessel purchased under the name of Robinson was the sailing ship Blessing, bought in 1817 by Captain James Robinson (1768-1833), a master mariner originally from Whitby. This vessel stayed in the family until it was wrecked in 1845. Using the insurance money from Blessing, Captain Joseph Robinson (1816-1889), son of James, ordered and bought a new sailing vessel Stag, which was delivered on 14 May 1846. ‘Joseph Robinson & Company’ was formed by Captain Joseph in 1850 to manage the interests of Stag and other sailing vessels. In 1871 the Robinson’s had their first steamship built, the S.S. Stephanotis, and the company quickly built up a fleet of steamers, operating between 10 and 20 vessels from the 1870s to the outbreak of the First World War in 1914. From 1870 onwards, the company was managed by Captain Joseph and two of his sons; Joseph Robinson Jr (1846-1904), and Nicholas J. Robinson (1847-1902). The name changed to ‘Joseph Robinson & Sons’ in 1883 before eventually becoming ‘Stag Line’ Ltd in 1895. These three men oversaw the running of the company, helping to transform it from a small-scale, local endeavour into one of the most efficient, successful, and respected North Shields tramp ship companies in the nineteenth century. The image of the trippant stag, bringing up notions of nobility and grandeur, was adopted on the funnel of every ship, on the top of all company correspondence, on the front and side of the company’s office building and even etched into the windows of this building. This symbolism was a prominent part of the company’s identity when ideas of imagery or branding were as important commercially then as they are now (think Google, or Apple). The positioning of the building overlooking the Tyne at the end of Howard Street meant that not only could Stag Line’s owners oversee theirs and others’ ships entering or leaving the river, but also every ship passing through would see the large and prominent image of the white stag on a bright red background (unfortunately, when a council contractor was recently restoring the concrete around the sign he left the background unpainted and coloured the stag in red!). In summary, this building serves as a physical reminder of a by-gone age, where entrepreneurial Britons helped their families, communities and the maritime nation of Britain itself to prosper and thrive. In an age where Britain, with its sprawling empire and global shipping networks, was at the forefront of world industry and trade, it was in buildings like 1 Howard Street and in families like the Robinsons who operated in them, where all this ‘progress’ and ‘success’ was made. Without families like these, who helped shape their local society (and who were in turn shaped by them), maritime Britain and its associated buildings and industries may not have been the dominating, seemingly unsurpassable force it once was. Nicholas J. Robinson, Stag Line and Joseph Robinson and Sons (World Ship Society, Kendal, 1984). Oliver Carpenter, ”The Robinson Line of Boats’, Networks of Trust in a Nineteenth Century Shipping Company’, in Don Leggett and Richard Dunn (Eds), Re-inventing the Ship: Science, Technology and the Maritime World 1800-1918 (Ashgate, Forthcoming). Open Monday to Friday from 8.30 AM till 5 PM and Saturday from 10 AM to 5 PM. Closed on Sundays and public holidays. Individual visits are available during opening hours for a 5 EUR charge and guided group tours are available by request (can be conducted in English, French, or Dutch). 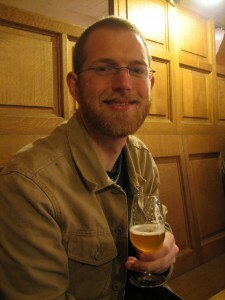 Cantillon Brewery is a small, family-owned brewery but since 1978, it has run primarily as the Brussel’s Gueze Museum. Having seen few changes since it opened in 1900, the brewery is working museum exhibit of late 19th-century brewery technology. It is operated by the Van Roy-Cantillon family as a brewery for lambic, gueuze, faro, and kriek – all beers that are made with wild strains of yeast and undergo spontaneous fermentation. When it was founded, it was just one of many gueuze breweries in Brussels, but today it is the last! Walking into Cantillon for a tour is like stepping into a different time. With the exception of the towers of beer being aged, nearly everything else in site is more than 100 years old and still performs a function in the brewery. Going through the brewery either on a guided tour or with the self-guided brochure, takes one through the brewing process from grain to bottle. First, in the mashing house is the mashing tun where 1300kg of wheat (35%) and malted barley (65%) are mixed with 10,000 liters of hot water (max temperature of 72C) for upwards of two hours. 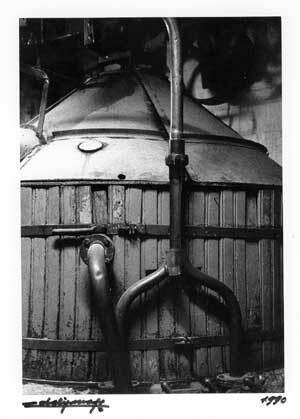 The wort, as the mixture is now called, is strained and pumped into the brew kettle, also called the hop boilers, on the first floor. The remaining solids, called draff, are sold as fodder. The wort is pumped into two kettles, hops are added, and it is boiled for 3 to 4 hours. At that point, it has reduced by a quarter and the sugar content of the liquid as risen. It is then pumped through a hop container to filter out the hop solids and into open-air cooling tun. This is the most important room at the brewery because while the liquid cools in this hand-riveted masterpiece of coppersmithing, it is inoculated with wild yeasts! These strains are specific to the cooling tun room and the brewer protects this room as a sanctuary for them. In 1985, when the original roof was replaced, it was not removed but covered with new tiles to prevent any disturbance from upsetting the special microorganisms that lived there. The next day, after the liquid has cooled completely, it is pumped into oak or chestnut barrels to ferment and age. 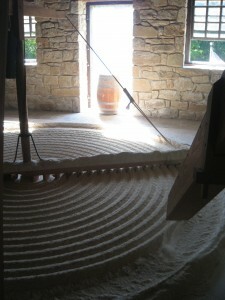 In three to four weeks, a slow fermentation starts and continues for three years. Lambic is ready to be drunk as soon as a few weeks after fermentation starts but traditionally, brewers wait for at least one year for a better beer. Walking into the Barrel Store is a truly unique moment, as lambic fumes fill the air and history surrounds you. Throughout this area are the other various tools that the brewer uses to clean and maintain barrels – some of which are older than the brewery. 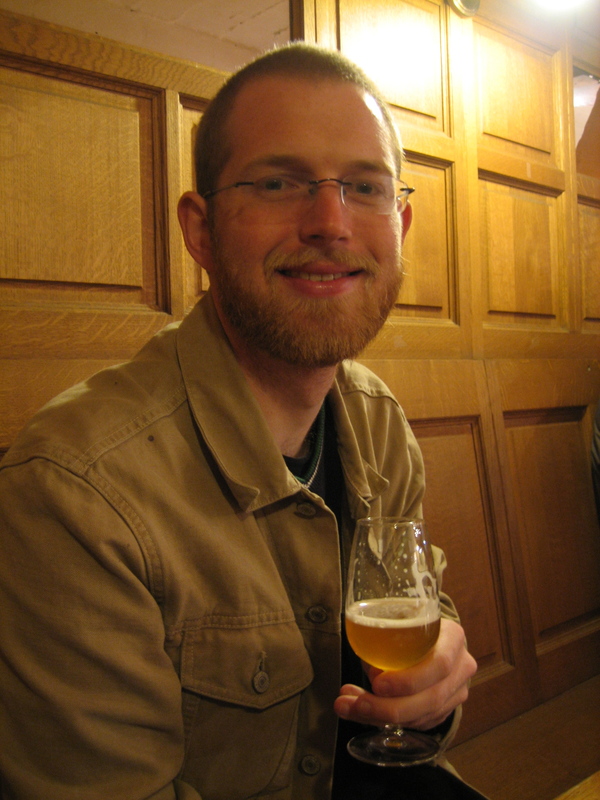 Gueuze – blend of 1, 2, and 3-year olds, fermented in bottle. Can be aged for a long time. Kriek – Schaerbeek cheeries in two-year old lambic. Rose de Gambrinus: Raspberries in two-year old lambic. Fou’foune: Apricots in two-year old lambic. Plus, a range of other specialty products that may be available when you visit! So, enjoy a couple of glasses in this unique historical setting! Open daily 10:00 a.m. to 5:00 p.m. from April 1 through October 31. Admission is just $4 for adults, $2 for children ages 6-11, and free for children 5 and under. When combined with Mount Vernon admission: $2 for adults, $1.50 for children ages 6-11, and free for children 5 and under. According to Mount Vernon’s website, the mill only operates on the first weekend of the month. George Washington (1732-1799) played many roles in the foundation of the United States: soldier, hero, commander, President, and Patent Officer to name a few. Yet, most of his life was occupied by the demands of running a large plantation. Mount Vernon in George Washington’s days encompassed nearly 8,000 acres divided into 5 working farms. The Mount Vernon that exists today is the remnants of one of those farms, his Mansion House Farm. In addition to the Mansion House, the original site of George Washington’s Gristmill and Distillery has survived. In 1754, when he inherited Mount Vernon from his half-brother’s widow, it included a small “toll mill” used to supply the plantation and it was used by other local farmers to process their crops. In 1770, Washington decided that he wanted to build a “merchant mill” that would process grains for use on the farm but, more importantly, for trade. 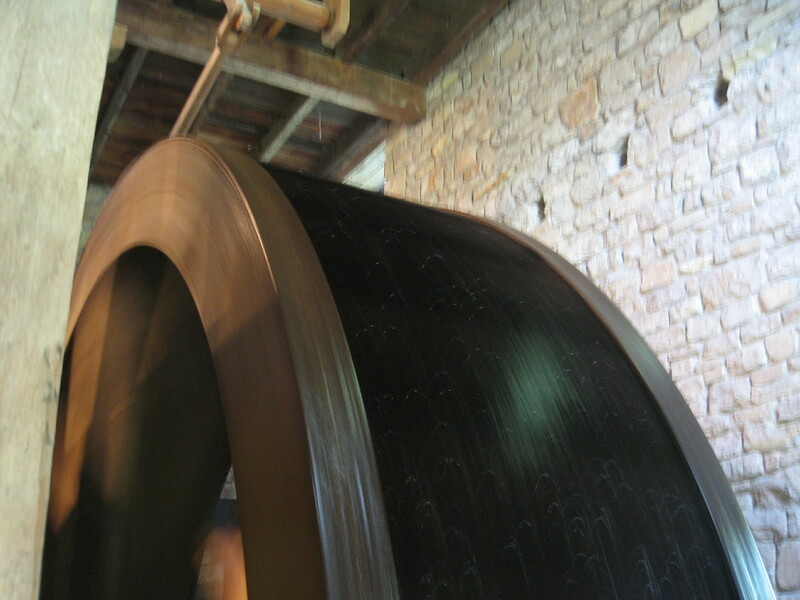 This mill was powered by a large water wheel. To ensure the supply of water, Washington had a a large mill pond and several miles of millrace constructed. The mill opened in 1771 and, despite water shortages that restricted the months of operation, flour from Mount Vernon was being traded along the East Coast, throughout Europe, and within the West Indies. In 1783, Oliver Evans constructed his Red Clay Creek mill, near the Delaware and Maryland border. A traditional mill typically used four floors to carry out its successive functions: grain was cleaned on the top floor, ground on the second, collected on the first, and hoisted back up to the third to cool and dry. This arrangement was labor and time intensive and Evans realized the benefits of mechanizing the entire process. In his Red Clay Creek mill, after it was delivered, human hands did not touch it until it was sorted and ready to be shipped. Powered by a single water wheel, grain delivered at a window of the ground floor rose to the top floor, descended by gravity, and was moved through all the stages of drying, grinding, spreading, cooling (see next image), and sorting. Nothing like it had been seen before anywhere. According to Eugene Ferguson, the combination embodied “the totally fresh concept of a continuous manufacturing process” and “demonstrated for the first time the fully integrated automatic factory” (Eugene S. Ferguson, Oliver Evans: Inventive Genius of the American Industrial Revolution. Greenville, DE: The Hagley Museum and The University of Delaware, 1980). During the late 1780s, Evans was granted a number of state patents for his various ideas and after the federal patent system was established, he applied for one. He was granted the third American patent (December 18, 1790) and it was signed by both Thomas Jefferson and George Washington. After signing the patent, both Washington and Jefferson became licensees of the Evans system. In 1791, the new system was installed at the Mount Vernon mill. It is unknown for how long milling took place in the original mill. The last record is from 1850 when the mill was razed because of its condition. The Gristmill and Miller’s House were reconstructed in 1933 by the Commonwealth of Virginia based on archaeological and documentary evidence. The site was conveyed to the Mount Vernon Ladies’ Association in 1997. Today, Washington’s Gristmill is the only mill in the United States with an operating Oliver Evans system. In 1797, George Washington started distillery whisky in the cooperage of his Gristmill. In 1798, he had completed construction of his Distillery. In 1799, with a production of nearly 11,000 gallons, it was the largest distillery in America. 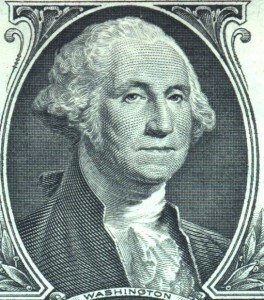 Making mainly rye whisky, the Distillery provided George Washington with another source of income that supplemented what he received from the Gristmill. The Distillery burned in 1814. 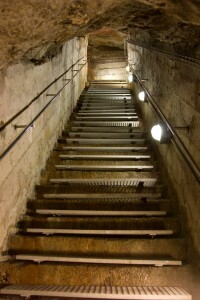 The foundations of the distillery building were discovered in 1933 but were recovered by archaeologists at that time. In 1999, archaeologists began to investigate the site and worked for five years. 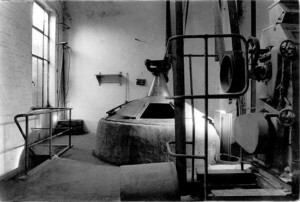 In 2007, the reconstructed Distillery opened. 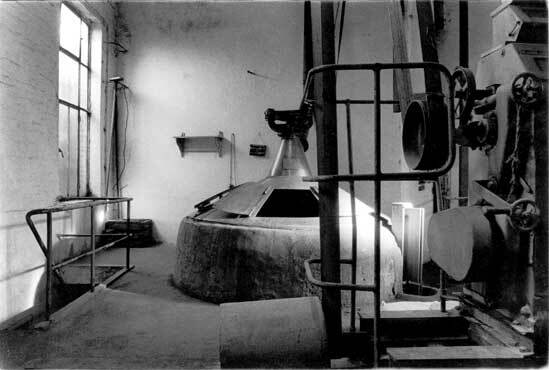 Today, it is the only example of a working eighteenth-century distillery and has successfully produced whisky. 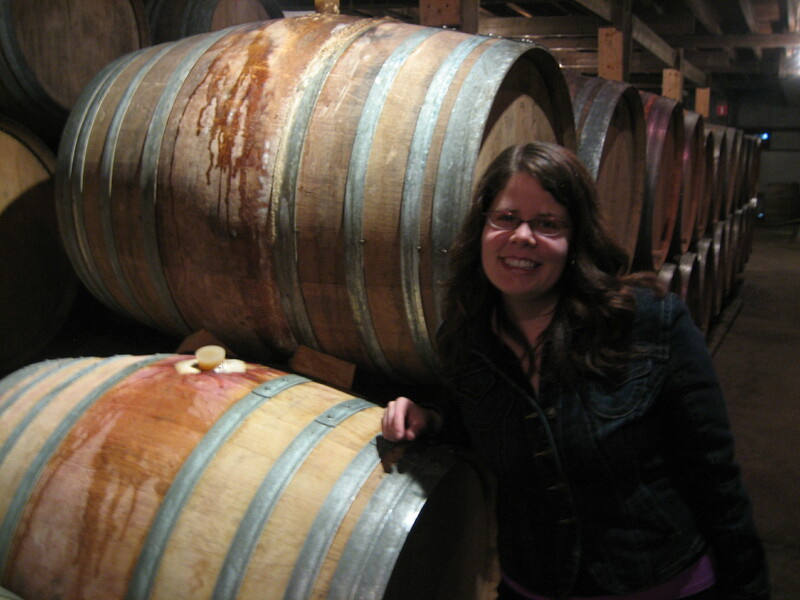 Want to hear about the latest travel guide articles? Subscribe to our RSS feed for regular updates. Would you like to contribute a new article? To get started, please check out our style guide for contributors and do not hesitate to contact us. We're always looking for new contributions. Be sure to check out the world map of all our articles. Want to know more about the society itself? Check out our main website. Be sure to check out our Exeter History Travel Pamphlet [pdf, 2.2Mb] produced especially for our 2011 Annual Conference in Exeter.